The only showroom in Southern California. 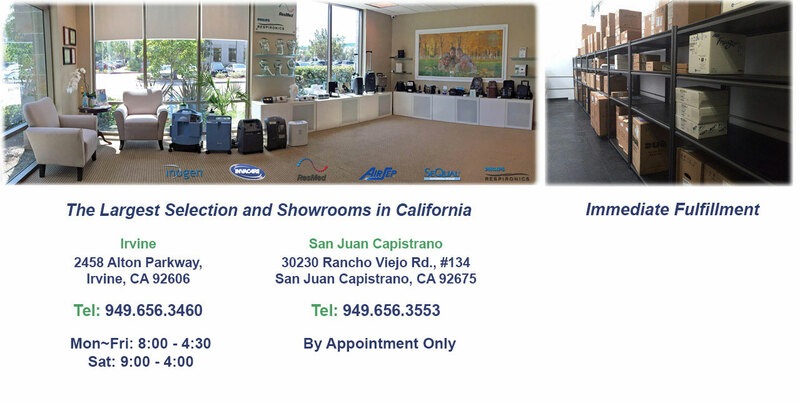 1,000 sq/ft showroom dedicated to O2 Concentrators. The largest selection with over 20+ models. 30 Day Return Policy & 60 Day Exchange Policy. Trained Oxygen Specialists on-site to assist you. English, Spanish and Mandarin customer service. Refund: Must be within 30 days of purchase. A bi-weekly rental charge will be applied to all refunds. Exchanges: Can be made within 60 days from the date of purchase. No restocking fee applies. Special Note: For the health and safety of our valued customers, we cannot accept any returns or exchanges of oxygen concentrators that have been exposed to smoke or water damaged. We value the contributions that our veterans have made to our country. Not only will we assist you in working with your Veterans Hospital, but we also offer special military discounts. We are grateful for their service. We recognize that COPD and related cardiopulmonary disease affect patients indiscriminately. O2 Relief donates a percentage of each sale to 501(c)(3) charitable organizations, including the COPD Foundation, American Lung Association, Make a Wish Foundation and Wounded Warrior Project.